Your summer break is officially OVER! Pre-season training begins THIS THURSDAY at 6pm. Don't be late or you will risk the wrath of Miss Kelly, your new U15 coach, not to mention Wonky et al. Bring along your friends too - now is the time to get new players involved - after all what else are they going to be doing on a summer evening? Summer holidays are here - so posts on here may drop off for a week or so. But in the meanwhile why not have a go at this quiz on women's international rugby? Are you an expert, or only qualified to be a member of the IRB? You decide! I've mentioned SportSister a couple of times before since its launch a year or so ago - and it really is becoming a "must see" (or "must read") for anyone with any interest in women's or girls' sport. Apart from news, there are interviews with sportswomen (both international and up-and-coming juniors) - including an excellent one with England's Rachel Burford which I am ashamed to say that I missed when it appeared at the end of last year. And if there is any criticism of the site it is that there is now so much on it that these gems are quite hard to find, unless you log in regularly or use Twitter (no RSS link, no Facebook). At the moment it is majoring in summer sport - including some competitions that those of you who enjoy surfing or other beach activities will be interested in - but its rugby coverage is pretty good in the season (could be better, but they can presumably only cover what they know about) - and presumably the more rugby player readers they get (and hear from) the more they will publish - but in the meanwhile there are also plenty of general articles on equipment, fitness and nutrition. And its interesting to see what is happening in the world of women's sport generally. A slightly worrying thought prompted by a small story from Singapore today - are we likely to see repeats over here this winter? The much awaited final of the Guinness Singapore Women's Rugby XV 2009 between Blacks RFC and SRC has been postponed to 8 August 2009 as two players from SRC are suspected to be down with the H1N1 virus. Though a relatively mild virus, by all accounts, the inconvienence of widespread postponements of games and training sessions could be significant - especially if they affect the regional programme. This dinosaur (a reasonable metaphor - huge, lumbering, been around since the dawn of time, out-of-date, not fit-for-purpose, and wreaking havoc with everything in its path whether it intends to or not) causes enough problems as it is, but - with very little room for manoeuvre in the calendar if anything goes wrong - in the past it has always been the club game that has suffered if postponements have hit the regional programme. Hopefully it won't happen - and there is not a lot we can do if it does, other than hope that RFUW allows regionals to take their share of the pain... and not throw in new Superleagues or other random ideas. 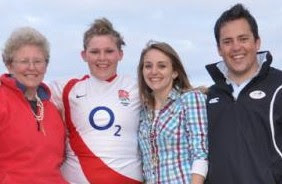 A word of congratulations to the "other" England women's rugby team - the team that makes Catherine Spencer's team-mates seem high profile celebrities. The team that finished third in their World Cup in Australia. I am, of course, talking about the England Women's Rugby League team. It must be slightly deflating to fight your way through to the peak of your sport, represent your country on foreign soil, come back with an unbeaten record, and still have your press coverage limited to a few paragraphs in the Runcorn & Widnes Weekly News. But such is life, presumably, for coach Brenda Dobek's young team (average age 22, with three U18s!). So its worth recording here that her team beat France 36-0 last Saturday, following up on their 28-8 win the Sunday before. That performance co-incided with another piece of good news for Brenda and her team - the next Rugby League World Cup, with its intergrated women's competition, will take place in England in 2013. The cluster with Saracens for the Thames Valley league next season promises a whole new experience as we have never previously taken part in a league - partly because no league had been set up near to us, and partly because various concerns team managers have had about leagues generally (and, considering the inter-club friction that some leagues have produced, this has maybe been justified). Reports about the Thames Valley league, however, seem to have been positive - not least, perhaps, because its main aim has always been to develop the game rather than simple "prove" who is "best". It is an inter-county "cluster" league, with one team from each of the region's counties bringing together girls from that county's clubs. Its been going two or three years now, with Saracens joining after the league's first year. And this season we will be "clustering" with them as a joint team. Virtually the entire country is now covered with leagues, of one sort or another - we are probably one of the last clubs to join one. The "Surrey league", which Welwyn and Wimborne are in, seems to have swept up most of the south, while Basford are in a league covering Kent. The Nottingham-based league that started last season seems to have expanded across most of the midlands (Worcester will, I believe be in this next season). Not sure sure what is happening in the North East, but it seems that North West teams play in a "merit league". Which leaves the South West. You may remember that this launched last year, and is based on a centrally planned series of mainly triangular fixtures - each club hosting two visiting clubs on a rotation each week for either three separate games, or a single game combining players if one club does not have enough. Its a great plan - and worked brilliantly well in the first year - so much so that it is expanding this year from 9 to 14 clubs. The organisation of this league is an astonishing piece of work that even takes into account journey times when organising the fixtures. But overall what is trully remarkable is the way this wonderful explosion of ideas - all these different ways of doing things - have emerged responding to local needs and circumstances. And all without any central direction, dictat, or control. What works is being allowed to work. There is a lesson there somewhere. You will notice that the clock has suddenly leapt seven days - because the club's Registration Day will be on 30th August instead of the first Sunday in September (mainly because that first Sunday is quite late this year). The actual registration will be from 12 o'clock and it is very important that you come along with a parent or someone similar who is in posession of a cheque book. If you are not a fully paid-up registered member of the club you are not insured - and that is not just problem for you. If you play uninsured then the risk is that everyone else on the field may not be covered, so (even though serious injuries are, fortunately, very rare) its pretty important that all the paperwork is completed. The various boys junior age bands are intending to run a variety of money-making stalls - whether we do the same has yet to be decided. The problem we have is that the first county rugby session is only two weeks later and, if any of you are to stand a chance of getting into the squad for the first tournament (in Sussex on 27th September) you'll need a few weeks of training beforehand. Its therefore pretty certain that there will be girls' training on the 30th August, if not before. Interesting review of U20 Nations Cup from the England coach. Includes an assessment of all three opponents, plus news about the next Nations Cup (which it is confirmed will not be until 2011). The RFUW have made some very significant changes to the process for selecting next season's U20 team. Full details are here, but the headline news is that it will not be an Open Trial. Players will be selected for U20 trials from this season's HPAs. This includes existing U20 players who will have to go through the HPA process. Of course, what this means is that anyone not at HPAs will not be able to go to the England U20 trials. If in operation last years this would have probably meant that Sasha would not have been selected to trial (after all, she was not selected for the TDGs), never mind make the final squad and play in four internationals this season! As it stands it also means that Hayley - who narrowly missed out on U20 selection last time - cannot go to trials this time around. In practice most U18s will be okay - Sasha's non-selection at last year's HPAs can be seen as an anomaly - but for over 18s its a major change. The problem is that, though regional rugby is big thing at U18 level, from what I saw and heard last season it is treated as a bit of an irrelevance by seniors. The standard of the East U18 team last season was significantly higher than the East senior team for the simple reason that most players (especially if they turn out for good clubs) can't seem to be bothered with it. The reasons for this are many, and not wholly relevant here, but its a racing certainty than many talented 18 and 19 year-olds who should be in contention for U20 places did not take part in this season's senior regional programme because they place their priorities elsewhere (or is someone going to tell me that those who attended the East senior trials last season really were the best adult players in East Region outside the England squad?). The England U20’s is not a closed shop! Players who are not invited to attend the HPA’s this summer should ‘re-enter’ the player pathway by playing for their region. If selected and perform well, players will be recommended to England U20 management and players may well be considered for international matches later in the season. Sounds all well and good - but the regional programme doesn't start until the end of January! The matches then take place from February to March so there is fat chance of any "recommendation" winging its way to HQ much before Easter. What chance will a late addition have of getting into the squad three-quarters of the way through the season? Oooooohhh.... none? Its madness - and its unfair. At no point last season was there any indication that this year's senior (or, come to that, junior) regional programme would be the beginning of the selection process for next season's U20s. And that is before you consider one important little matter. The senior regional programme is a senior programme. Not a U20 programme. It is very probable that 18 and 19 year olds in senior regional teams will not have got much game time (Hayley spent most of her regional games on the touchline) - after all regional coaches will not have been picking their teams with U20 selection in mind. The U20s this year have been a brilliant success. It is therefore not unreasonable to suggest that the selection process used must have been pretty good - so why change it? RFUW sat that "the changes have been made to ensure that we are putting resources into the players that will benefit from them" - which sounds a bit of flannel as the last year's trials cannot have been highly resource intensive. Some might suggest that the real reason is to prop up a senior regional programme that was fast becoming an expensive irrelevance - I really cannot comment. What I would suggest that that there are going to be a lot of really annoyed 18 and 19 year old players out there - players who are going to have a difficult dilemma come January. Go for region and risk someone else taking your club place while you are away, or put your loyalty with your club and give up on any U20 ambitions? One other sideline coming out of this is that RFUW only anticipate two U20 internationals next season - so presumably no U20 Nations Cup in 2009/10 (or at least England will not be taking part in it if it does go ahead). Something of a first this. The IRB have started what they say will be a regular column on women's rugby on their website. Of course this sudden recognition for the game has nothing to do with the bid for a place at the Olympics - its sheer co-incidence that the articles will concentrate on sevens. Cynical though that may be, at least it does exist and interesting it is too - not least because it is not being written by one of the usual suspects - ie. a player from one of the major nations - but instead is being penned by the Uganda Women's captain, Helen Buteme. Uganda's women qualified for the Sevens world cup earlier this year - an achievement which, Helen points out, no men's team has matched in any sport in the country's history. Beyond that its a familiar litany of underfunding and media invisibility - but there are plenty of positives too. Not sure how often Helen will be writing, but it looks worth following. How does your rugby compare with New Zealanders? They are the current World Champions and - despite their lack of intenational play (or, frankly, board support) the New Zealand women's team are awesome and will be a huge test for England in November. So where does this skill come from? How good are they at - say - the same age as you? A clue may come from this recently posted video of highlights from the Secondary School Girls Rugby Festival - a pretty significant event as it is the only 15-a-side event in New Zealand for schoolgirls. So these will be some of the best players in the country - and there are some smart moves to be seen - but overall, what do you think? Could you hold your own at this level? England U20s: best in the world? Today's U20 Nations Cup final wasn't a contest - it was pure slaughter. Last week England beat the USA by 40-7 - today they exceeded that score before half-time. But they were not content with that and kept pressing on - relentlessly - to rattle up 18 tries in a 110-0 annihilation of (let's not forget this) one of the top four U20 teams in the world (RFUW report). By a country mile this must be the highest score ever achieved in a U20 women's international - or any other age group game (well, so far as can be traced). Better than that - its the biggest win by any England women's team ever - eclipsing the senior squad's 101-0 win over South Africa four years ago - and by a long way the biggest defeat that the USA - or any other leading women's rugby nation - have ever suffered. On this form could any other U20 side live with this England team? It seems unlikely. It took England - with Lizell starting for the second time (this time at full-back) - just four minutes to begin the massacre. Another seven tries followed before half-time, with England 43-0 up. Lizell added another try with a minute of the restart after which tries came regularly. Worcester centre Sam Bree racked up six tries adding to the five she had scored in the previous three games - a remarkable performance. Finally if there was any question that USA were fortunate to make the final, the fact is that the other three teams were very closely matched and any of them would have probably suffered in the same way. To emphasise this earlier Canada - finally putting in the sort of performance we expect from them - squeezed Wales (who had been seconds away from beating the USA last week) out of third place with a 12-10 win. So where next for this England team? Well, for many after three or four years with the team it was their last game at this level and they will be attempting to get a place in the senior squad - but for everyone else it will be back to square one and the U20 trials in September! If you want to try to get into this team of world-beaters these will be "open" trials that anyone aged 17 or more can attend (though it is recommended that you should already have played at least regional rugby). Further details of where and when the trials will be should appear in the next few weeks. England rounded off a clean sweep of wins in the group stage of the Nations Cup today, but were made to work for it rather more than in their first two games, Wales holding them to only three tries and a 29-3 win (see here for RFUW match report). For the first time in her England career Lizell did not get on the scoresheet, and Sasha had her shortest run-out so far (only 10 minutes). England had perhaps stepped off the gas slightly - certainly there were a number of changes to the starting lineup for this game - a tactic that would be sensible with the final only three days away. In that final they will meet the USA who came back from a difficult start to run out winners over Canada 38-20 - the first time they have ever beaten their North American rivals in an age group international. In fact the whole tournament has been a bit of a disaster for Canada, conceding over 100 points in three games despite the huge effort that they have made to develop the game in recent years - but all that effort seems to have been undermined by inept preparation for this tournament. But the Canadians' disappointment must pale into insignificance compared to Wales - missing out on the final as a result of one sloppy pass - the fate of their entire Nations Cup programme overturned by one fractional misjudgement. But that is sport, especially at this level! Can you spare 2-3 hours per week to make the World Cup live on beyond 2010? If so the RFUW want to hear from you. They will shortly be appointing 10 regional-based "Legacy Project Officers" (before you ask it looks like these will be kind-of RFU regions, so we become "London North" and there is no Thames Valley). Each LPO will be heading a team of volunteers charged with planning and delivering three projects that will promote the World Cup but also have a positive effect on the area involved. The projects should be based around four themes: More Players, More Volunteers, More Competition and More Sustainable Clubs. All the projects can be from a different theme or they can all be from the same one; whatever is best for the local situation. If you are interested you need to complete this application form and send it back to Holly Hart, RFUW, Rugby House, Rugby Road, Twickenham, Middlesex, TW1 1DS or email hollyhart@rfu.com. All applications will have to be supported by a member of RFUW/RFU staff, a CB committee or University (this can be arranged). If you have any questions at all please contact Holly on the email above or by calling 020 8831 7482. The only snag is that while these posts were first advertised in June most people seemed to miss them (possibly because they do not seem to have found their way onto the RFUW website, though BUCS advertised the post). As a result there is not much time left to apply - like you have until Friday (17th). Apparently a yellow card was awarded - the referee thinking that there being no real sign that this was deliberate - just a bit clumsy. No damage done anyway - at least to Kimberley, who lasted the full 80 minutes. U20s: So many pictures, its like being there! Over 1,000 photographs (so far!) 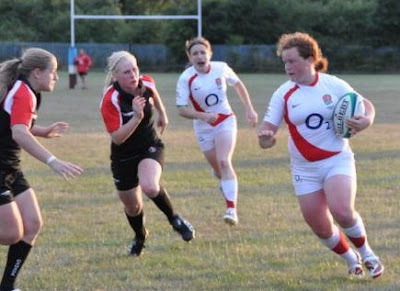 from the first two days of the U20 Nations Cup can now be downloaded - free - from girlsrugby.org.uk. All four matches played so far are included, as well as "off-field" shots of the crowd and sundry familiar-looking ne'er do wells found lurking amongst the spectators (see below). The site - put together by Vincent - is (at his own admission) a bit raw and is currently unsorted or captioned (other than having separate galleries for each game) - but the pictures are chonological and, as taken in blocks, actually allow you to follow a move through - such as at the end of the England/Canada game (from where the picture to the right comes) where a 20-picture sequence shows Lizell initially running in strongly in support of an England attack, before receiving the ball and beating a couple of defenders herself (see full sequence animated below). Vincent is happy for the photos to be used freely for personal use, and just asks for users to consider making a donation to The Nazareth Trust. Drop Vincent a line by clicking here if you have anything vaguely commercial in mind. Not a great bit of video this, but thus far its the only coverage of any sort (stills or video) that I have found of the England U20s in this current Nations Cup. It comes from the USA's management, and features their try in their 42-7 defeat to England. Of rather more interest, however, is the fact that Sasha is in it (no. 17) - quite a lot in fact! USA v Wales last Thursday. Wales had gained a 3-0 lead early in the first half, and had defended like fury for the rest of the game. 79 minutes are now gone, the game is deep in USA territory, and - as you see - Wales even win a penalty. New Zealand - The Black Ferns - will end their first ever tour of England at Twickenham as part of "double header" of England vs New Zealand internationals. Spectators will be able to watch both the women's and men's internationals back-to-back. The last time England played at Twickenham - against Italy in 2007 - the game took place after the men's international and the game was shown live by the BBC (via the "red button"), so live coverage of the game in November seems extremely likely. "This is another very exciting development for the women's game in England. We have seen in cricket how a successful Women's World Cup campaign can add to the men's game rather than compete with it* and we are looking to make a similar statement in Rugby. Playing the current World Champions at the home of English Rugby is not only a fantastic opportunity for the players but also for the profile of the game." Unlike the Italian game (which was a barely advertised "extra") both matches will be marketed as the Investec Challenge Double Header "giving fans the chance to witness some of the game's best male and female rugby players at one sporting venue". Venues for the "first test" on the 14th and the "A" international on the 17th have yet to be annonced. The irony of an England world cup warm-up game being allowed to take place at Twickenham when the best the actual world cup itself is being offered is The Stoop has also gone without comment. [*The recent cricket 20:20 world cup included women's and men's semi-finals and finals at the same venues, resulting in live TV coverage for the winners - England - which has in turn been followed up by dramatically improved news coverage of the women's game throughout the season]. A couple of practical lessons in sevens rugby from last weekends tournament are now available, courtesy of Germanrugbytv and the England women's team. Sunday was a brilliant day of double success for England. This morning dawned in Hanover with the England sevens team looking back in satisfaction at their group stage performance yesterday where they had demolished all that had been put in front of them. Five wins from five, 87 points scored (15 tries) and a single try conceded put them into the at the European Sevens semi-final against the host team, Germany. Meanwhile in west London England U20s awoke knowing that, after Thursday's comprehensive win over Canada (Rugby Canada report now available) - which a recount seems to have raised to 47-0 - a similar performance today against the USA should seem into next week's final. The sevens team were first on the field. While the U20s were having breakfast, England's Sevens team were having Germany for lunch. A 42-0 eight-try win saw them into the afternoon's final, where they would face Spain - who they had already beaten 24-0 in the group stage. While they relaxed, the U20s took the field against the USA - and blew them away. With Lizell in the starting XV for the first time, it took only eight minutes for England to take the lead. Seven more tries followed, Lizell's being the last after 64 minutes. A consolation try for USA six minutes later changed little as the scoreboard read 40-7 (RFUW match report) and a guaranteed place in Saturday's final. With Wales beating Canada 16-11 (Rugby Canada report)the identity of their opponents is still in some doubt - USA need to beat Canada on Wednesday to make sure of their place, but failing that Wales could still make it with a good performance against England. Canada are out of the competition - their "preparation" now appearing an object lesson in how not to get ready for a major international tournament. As the U20s left the field, the Sevens team were in action in their final - and a rather tougher game it was with the team coming back from 10-12 down in the second half to win 20-12 (RFUW sevens report) and retain their European crown. So, one international trophy and one international final - not a bad day's work. The senior England sevens team will be aiming to put World Cup disappointment behind them this weekend when they attempt to retain their European Sevens crown in Hanover. This will be the sixth women's European championship , and England have never failed to reach the final. They did not enter the first tournament in 2003 (which was won by Spain), but did enter the next event in 2005 beating Spain 14-0 in the final of an event they totally dominated, conceding one try over a weekend of six games. England were similarly dominant in 2006, with a total shutout until the final when Wales shocked them, winning a dramatic final 10-7. 2007 was far tougher, with England losing to France in their group, sneaking through the final with a two point win over Spain, and then losing the final comprehensively 19-5 to France. Last year, however, saw a much more dominent performance, with England strolling to the title with a 52-0 win over Netherlands in the final. So - a place in the final is the minimum that England will be aiming at - particularly after the World Cup failure (for such it was - for a team that were Number 1 seeds and red hot favourites to only reach the quarter finals was a severe disappointment, especially when the tournament had been given priority over the Six Nations defence) - but they are in a tough group. England will open the tournament at 10am with a pretty easy game against Portugal, before 80 minutes later they face a significant banana skin - Sweden - the shock winner of a place at the 15s World Cup thanks to wins over Italy and Spain. England have never been troubled by Sweden at any level, but never before has Swedish rugby been on such a high. Two hours after that it will be women's sevens specialists Spain (whose record in the tournament is second only to Englands) before finishing a long day at 3.50pm against France. On Sunday - if the tournament follows the seeding - England are due to play Russia (but might equally be faced with Italy or Netherlands) in the morning before the final at 4pm. The English team is very different to the side that dominated last year's tournament with several new faces. Overall England should reach their target and retain the title - but tomorrow will be a long day crucial and slip-ups are possible! Every summer, it seems, someone has the bright idea of producing an independent newspaper (or electronic newspaper) devoted to women's rugby. And a good idea it is too - there is a staggering amount of largely unreported and really quite interesting news out there, not to mention the mountain of totally unused opportunities to question those in authority about what the heck they think they are doing with the women's game. For anyone with a modicum of journalistic ability the game is an untapped goldmine of opportunities (and with a potential audience approaching 10% of all rugby players worldwide - and 25% in some of countries). The only snag is that, to date, nothing has ever come of various schemes. The plan to launch a printed magazine a couple of years ago faded into nothing, and last year an e-magazine got as far as a swish and technically clever website but never seemed to find anything to put on it (beyond a few recycled RFUW press releases). 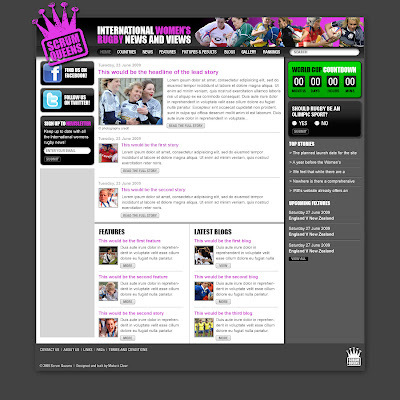 "offer the best in news, features and results for the sport across the international game". The draft homepage design appears to the left. Each nation (well, those nations in the World Cup, not yet all 70+ active countries) will also have a home page of their own. "in-depth coverage of international competitions such as the Six Nations, the European Championships and the Women’s World Cup"
which will be great as the only place this year to give full coverage to all of the above was, well, this blog! "The IRB's website already offers an excellent resource and snapshot of news from the global game"
That might be about right if you interpret "snapshot" as something very small and random, but "excellent resource"? The site that lists every men's international since the dawn of time but cannot list women's internationals that took place two months ago? No. "certainly not looking to be a mouthpiece for the bodies but of course I will be in touch with the IRB and all of the unions for news and stories and interviews over time, so there will be a fair bit of collaboration between us. I've already met the RFUW as it's important for me to have a relationship with them for when I'm after interviews/pictures/clips etc but I'll be reporting from the games myself at the 6 Nations/home friendlies and the WC so it will be very much independent opinion." She also assures me that she will not be simply republishing press releases (which is the sum total of all the BBC do, for example!). Launch date should be some time in September (just in time for the Asian qualifiers I suspect) - so watch this space, and if anyone wants to contribute Alison would be delighted to hear from you. Lizell and Sasha both began the opening round of the Nations Cup on the bench, and both came on together halfway through the second half. Despite that there was still time for Lizell to score her second try in two internationals. However, this game was rather more one-sided than the visit to play Wales at Colwyn Bay in the spring as England scored seven unanswered tries in their largest win in a U20 international, and their largest win in any age group game since they beat Canada 48-0 in at U19 level in 2004. Sounds like the last minute replacement of the entire Canadian coaching team (see earlier post) was a brilliantly effective strategy - for their opponents ! Click here for full match report (from RFUW). With USA sneaking home 7-3 against Wales thanks to a try from the final play of the game (see reports from USA rugby and Welsh RFU), England look extremely well placed to retain the title. In fact USA could be England's biggest barrier - and you can follow their campaign from the inside via the USA's team blog. Learn all about their visit to the Olde Country, from their first English culinary experiences (the Full English Breakfast - which may account for why they could only beat Wales by four points) to their views on the luxuary accommodation they have been given for the tournament (aka "The Orphanage"). If you went to today's games, what did you make of it? Any photos? The official photographer for the event seems to be Scrumpix - but nothing is currently available on their site. A real last minute appeal this, but the RFUW have sent out an urgent request for any junior players who might be interested in being be Ball Girls at the U20 Nations Cup, starting tomorrow. They are looking for 6 Ball Girls at each Game - so you do not have to commit to every day, and the offer is open for any games up to and including the 18th July. Its a bit first-come-first-served but if you are interested contact James Fisher at the RFUW JamesFisher@rfu.com now! You will receive some ‘stash’ (free kit) as a thank you. The latest edition of the RFU's free Touchline magazine in now out. Available both electronically and as a glossy paper magazine (contact gameinvestment@therfu.com for copies) it is in some ways a model of how rugby journals should be. Okay, it is an "official" journal and therefore everything in the garden is always rosy, the sun is always shining, and heaven forbid that anything even slightly controversial should ever be so much as hinted at in its pages - but that aside its real plus point is that every issue gives a very fair coverage of the girls' and women's game. Seven out of 50-60 stories in the latest issue are about women's or girls' rugby, and around a quarter of the photographs include female faces - most of them as active players - a far higher level of coverage than the women's game gets anywhere else (about 8% of the country's players are women or girls, so its actually very good coverage indeed). And one of the photos in the latest issue will be particularly familiar to you all (see the bottom of this page (click here) or the back page of the printed copy). Unfortunately in the printed issue its not a very clear image as, for some reason, the editor did not use the higher quality image sent to them but rather the one off the RFUW's website. Never mind - its the "thought that counts"! (On the subject of which its also the second time in as many years that an article that is - at least partly - about a Worcester RFC triumph has been illustrated by a photo of Letchworth RFC so I'm not entirely sure what "thoughts" the Warriors have about it...). There is also an interesting article in there that should send you checking you family trees. Its a men's rugby story, but still with some possible relevance to you. Apparently a teenage player from Yorkshire will now been travelling the world (or at least bits of it) thanks to the discovery that one of his grandparents is from Latvia. A chance meeting between his father and some Latvian rugby officials has lead to his being on a plane to Moscow to play for Latvia in the Eastern European Sevens. Finally I have come across what is possibly the only commercial book on women's rugby to have ever been published anywhere. Unfortunately the book (Des Filles En Ovalie by Jacques Cortie, Atlantica, 2005, ISBN 9782843949043) - the story of the first 40 years of women's rugby as an official sport in France - is in French so I am totally unqualified to say anything more about it (even if I had a copy, which I do not). But if there are any French linguists out there who fancy a bit of practice over the summer it might be mildly more interesting than the usual works in that language that you may be given to read. The title translates directly as "Girls in rugby", incidentally, as "Ovalie" is a French synonym for rugby union, which I find interesting. For some reason. The biggest-ever U20 women's international rugby is nearly here. The 2009 Nations Cup starts at Brunel University in North London on Thursday with arguably the four strongest international teams - England, Canada, Wales and the USA - playing each other over the next week for a place in the final on the 18th. As highlighted a couple of weeks ago there will be a number of familiar names in the England team - not only Lizell and Sasha, but also players from half-a-dozen or more teams that our U18s have got to know very well in recent years as many of the players were still playing "junior" rugby this season. 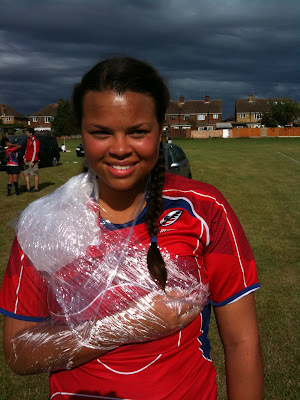 It is therefore quite a young U20 squad - though it has a core of experienced players, such as OA Saints and Hertfordshire's Sarah McKenna who seems to have been playing age group rugby for England since we began playing at Letchworth. England start tomorrow with probably their toughest game - against Canada. They too have a young squad - not to mention a completely new coaching team who appear to have had no part in its selection. Remarkably it seems that the squad was selected and trained by a different set of coaches who only learnt that they would not be travelling to England with the team this month when they attended the final training camp a few weeks ago. Whether this will have an effect on the Canadians' performance we will see, but it sounds less than an ideal means of team preparation. On Sunday England meet Wales, whom they have beaten three times in the last 18 months, including 26-8 in April. In fact the Welsh have yet to record a win since international age group rugby moved up from U19 to U20 a year or two ago, but it must only be a matter of time as their record as a U19 team was pretty impressive - including several wins over England. What is more the strength of their junior regional teams has improved dramatically over the past year so an England win cannot be taken for granted. Finally next Wednesday England round off with a game against the tournament's "mystery" team - the USA. A mystery because they were not at the Nation's Cup last season, and have only ever played two U20 internationals - both last year in a tour of South Africa. As their opponents on that tour have also never played anyone else it is difficult to know what to make of that tour's 1-1 draw. The USA do have a long record at U19 level (if not a very successful one - ie. no wins in 11 games before the South African tour) and many players from former U19 squads return to the colours this week. In fact whereas Canada and England have lent towards youth, the USA have gone for experience with only nine of the 25 player squad lacking international caps. They also had a pretty tough "warm-up" last month when they took part in the national U23 regional tournament (an event entitled, with typical American modesty, the "Women’s U23 All-Star Championships") where they battled through to win the "Tier II" event, recording some significant wins over theoretically bigger and stronger opposition - so they will lack nothing in preparation. I know that several people are going down to Brunel to cheer on the girls, so have a great time - and let's have a few pictures and reports! And finally good luck to the England team, and most especially ex-Legend "all-stars" Sasha and Lizell! The Times today reports that the Commission on the Future of Women's Sport (set up last year, and chaired by Tanni Grey-Thompson) will publish their findings tomorrow (Tuesday). The main conclusion seems to be that women and girls face major barriers when they come to play sport - especially traditionally male-dominated sports like rugby - due to the way many of these sports are run by "Old Boy networks" of former (invariably male) players. It highlights the way in which the governing bodies of a quarter of the 46 sports studied - including rugby - currently have no female members. The report will say that "we’re trapped by our history in sport of old-school committees and members’ clubs". The result is governing bodies that are "out of touch with half the population and risk compromising elite performance" due to an in-built conservatism and resistance to change. Such sports, the report will say, are often charaterised by a "macho culture inhospitable to working mothers, a lack of champions at the top and discrimination at the grassroots through stereotyping and inadequate facilities". These are barriers to both female participation and women landing the most senior jobs in sport. These appear to be just the first findings of the Commission - but the real question is less about what its final conclusions will be but rather more what (if anything) will be done. Though the Commission was established with the support of government, it is not a government report - and even if it was it difficult to see what government would do. Legislation is unlikely, but (on the other hand) are these "old boys networks" really likely to voluntarily change just by being shown the error of their ways? "Confident players with good skills having a really good time"
Believe it or not, but the above statement (which would look great on any promotional posters/leaflets anyone is planning methinks) refers you. And its not the words of someone from the club, or even someone that knows you - but a rugby follower from Australia who has put together a website of the best sources of information on rugby and - as well as highlighting this blog - has watched the video (top right) and been very impressed by what he has seen. Okay, the video is a couple of years old now and many of the girls featured have moved on - but those of you moving into their places are more than capable of playing as well as these girls did. Bear in mind that most of the girls in those clips had not picked up a ball much more than two years before! I know its just turned July, but news of a bumper August of international rugby has come my way and - as some of it might even count as another world "exclusive" for the blog - so I thought I'd post the details now. To begin with that "exclusive", as mentioned last week they England off to Canada to defend the Nations Cup that they won in the tournament in Esher last year. Full fixtures have not been published yet, but partial details have appeared on US and Canadian websites from which the full details can be worked out. The tournament will include five teams this year - England, Canada, France, USA, and South Africa - so that is the teams finished 2nd, 3rd, 4th and 5th at the last World Cup so its not a bad lineup. It will also feature South Africa in 15-a-side action for the first time since the World Cup - have they developed as well as their U20 side seems to indicate, or will they still be only competing for the wooden spoon - and France's first games against non-European opposition since 2006. A more detailed preview will appear nearer the event. These will not be the only internationals during the month. In Africa the continents second and third-ranked teams (Uganda and Kenya) will be playing their annual home-and-away tournament for the Elgon Cup. However the most important fixture of the summer will be taking place far away in the South Seas where, on 7th August 2009, Samoa take on Australia on a one-off winner-take-all qualifier for the World Cup the result of which is almost impossible to predict. In connection with this news has come out that this should have been a four way event also involving Fiji and Papua New Guinea (no news about Tonga). However Papua - who have never previously played any international rugby - pulled out for financial reasons, while the Fijian rejected the invitation to take part... without (from what I hear) even consulting their women's team. The reason may financial as well, but its a shame that they do not seem to have even given their women a chance to do a bit of fundraising. After this, we will know 11 of the 12 teams for 2010 and all we will be waiting for will be the Asian qualifier. Though I say so myself, I'm rather pleased with this season's countdown clock (see above). Its based on some free clocks that can be downloaded from http://www.ohiok.com/. However, their designs were all based on US sports - but with a bit of tinkering I've found a more appropriate image. If you want to include this on you own site or home page or whatever then the HTML appears below. You can also change the picture by changing the highlighted text - but if you do note that the image needs to be 300 x 200 pixels.